...why don't you click on the picture? 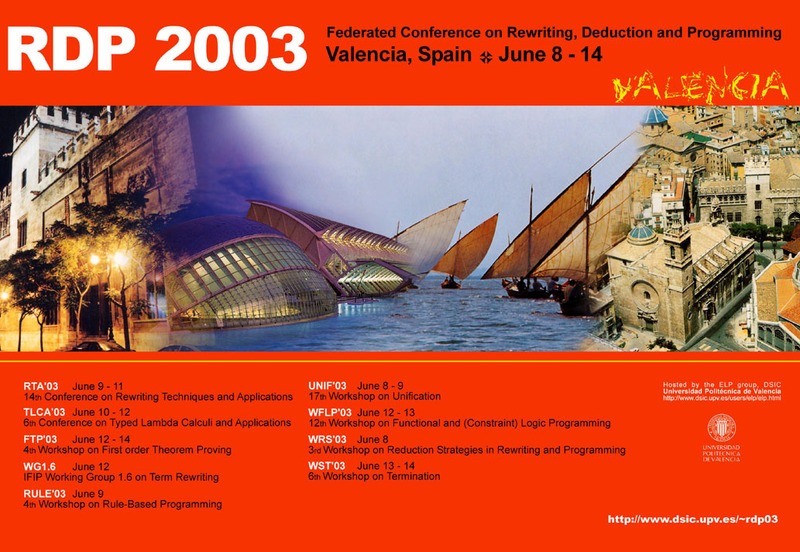 We are pleased to announce the Federated Conference on Rewriting, Deduction and Programming (RDP) to be held in Valencia, Spain, in June 2003. The conference will be hosted by the Departamento de Sistemas Informáticos y Computación (DSIC) at the Universidad Politécnica de Valencia. RDP'03 will take place at the ADEIT buildings of the "Fundació Universitat Empresa". The Second Federated Conference on Rewriting, Deduction and Programming (RDP 2004) will be held in Aachen, Germany from May 31 to June 5, 2004.